Not many people can sum up their life philosophy in just one word, but for Anna Getty, it’s all about balance. It’s a remarkably simple word that drives a powerful concept: finding balance in work, art, leisure, and parenting. And, on a more fundamental level, finding it in the way you eat, drink, and live. Anna Getty is a mother of two, chef, environmental advocate and green living educator and the founder of Pregnancy Awareness Month. 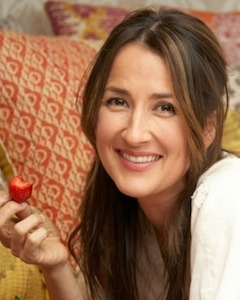 She has penned two books including I'm Dreaming of a Green Christmas and Anna Getty's Easy Green Organic . Anna is the eco-editor of Pregnancy Magazine. She lives with her family between Los Angeles and Italy. Anna, along with her business partner Alisa Donner, founded Pregnancy Awareness Month or PAM in of May 2008. 2010 marks the third year celebrating Pregnancy Awareness Month. Nurture and Wellness- 5 Ways To Take Care Of Yourself During Your Pregnancy…And Beyond.